Recent review: Wonderful face-painting and balloon animals. We really enjoyed having Peppermint!! The party is for a 2 year old girl. There will a variety of ages between 2 yrs to 10yrs old. The event is carnival themed. I was hoping for some clown fun, like jokes or clown around, make balloons, my budget is $200-$250. The event is open to the public but will be our first event so I’d say maybe 5 to 40 kids. I’m not 100% sure yet. The Anderson Elk Lodge will be holding it’s first family fun day with a boys and girls pass, Punt and Kick Competition. This is a free event for boys and girls of all ages and our main focus for the event is for children in need. Children from foster homes, low income families and more but it will be open to the public. No one will be turned away. We will have a DJ and photo booth as well. Planning on many activities for kids. I am still in the planning stage and looking for good entertainment for the event. When you think of a children’s party, what comes to mind? A cheerful clown of course! Our friendly birthday clowns love to play games and make the kiddos laugh! They can lead silly songs and dances, and may even whip up a balloon animal or two. Some of our clowns even know a few magic tricks! 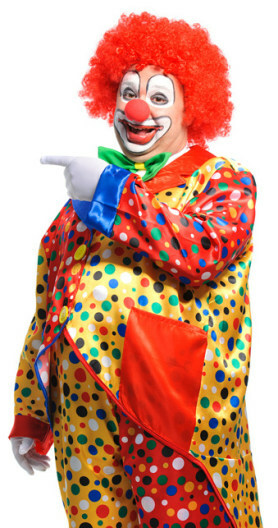 A clown is a perfect addition to any birthday party or community event that needs some goofy giggles. Search for Clowns in Anderson, South Carolina above. Please note that these Clowns may also travel to Belton, Sandy Springs, Williamston, Starr, La France, Pendleton, Pelzer, Honea Path, Iva, Townville, Clemson, Piedmont, Donalds, Central, Norris, Lowndesville, Liberty, Due West, Powdersville, Hartwell, Newry, Conestee, and Seneca.